Elephant Beach is a very prominent beach in the gorgeous and very popular island of Havelock. Havelock is one of the not-to-be-missed destinations of Andamans. 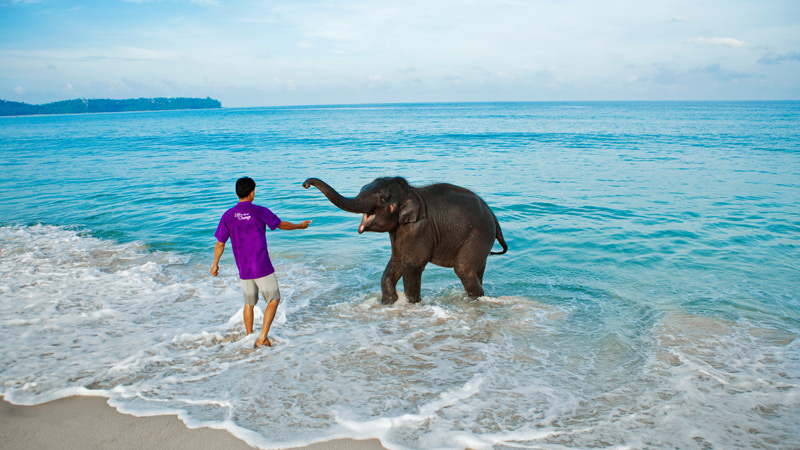 To reach the Elephant Beach, you need to travel by boat for approximately 20 minutes from the Havelock Island dock. Elephant beach is known worldwide for its white sandy beach and the crystal clear liquid blue waters that offer a clear of the colourful corals just at a depth of less than a metre. Such is the uniqueness of this beach. Elephant Beach is also very popular among tourists for being a hub of fascinating water sports and underwater activities. It is especially famous for scuba diving carried out by very expert and professional diving agencies. The beach front is majestic and will keep you in trance for hours together. The warm waters harbour a rich variety of marine life and it is a genuine pleasure to watch the life forms inhabiting the underwater world. This beach located in the Havelock Island will open up doors to rich coral reefs and astonishing underwater marine life that will keep you spellbound for long. The beach is idyllic and peaceful and sees a lot of tourists both domestic and international. A lot of honeymoon couples also prefer to visit this location to enjoy its exquisite beauty. The beach front is very suitable for relaxation with a combination of books, friends, family, drinks and food. Elephant beach offers some adrenalin-pumping adventure sports option like diving, snorkelling, sea walking, glass bottom boat rides and sea cruising. The trees along the sea add to the beauty by mixing some enchanting green with the enticing blue of the seas and skies. The beach is almost always crowded but you can always find a secluded spot to chill out taking in the exquisite beauty of the sand, sea and sun. What remains today is a part of the previous glorious shore line after it was massively destructed by the Tsunami of 2004.